Middlesbrough may be thwarted in their attempts to seal a permanent move for Mo Besic - according to reports. The Daily Mail claim that the midfielder, who is currently on loan at the Riverside Stadium from Premier League side Everton, is attracting interest ahead of the summer transfer window. Everton manager Marco Silva is believed to be willing to allow Besic to depart on a permanent basis in the summer, with a fee of around £9million required to seal his services. 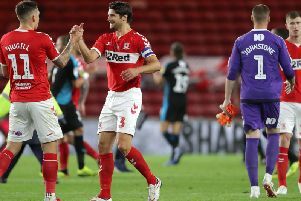 Middlesbrough have previously tried to secure the Bosnian midfielder on a longer-term deal - but were forced to settle for a season-long loan arrangement during the last summer trading period. Leeds United were also linked with Besic, but the Mail claim that two Turkish sides are now leading the pursuit of the 26-year-old. Their report suggests that Besiktas and Fenerbahce are both eyeing a move for the midfielder - while Tony Pulis is still keen on a permanent deal. And it is claimed that Besic 'will consider all options' ahead of what looks set to be an interesting summer for the midfielder.